The sudden growth of cryptocurrencies and its advancement to become a division to consider with can be traced back to the blockchain technology that started it all. Cryptocurrencies surfaced as a prototype, but now, within this short time itself, cryptocurrencies are changing the way in which man and money interacted from the origin. Cryptocurrencies are here to stay and Because of blockchain technology transactions are now far secure. In such a time the cryptocurrency einsteinium has made its mark. Popularly called as the EMC2, Einsteinium is a currency designed for raising money for philanthropic causes. It also raises money to fund many bleeding edge scientific research, advanced information technology research and cryptocurrency project. Einsteinium will shorten the distance between regular people and cryptocurrencies and will change the way the world looks at cryptocurrencies. Now with this cryptocurrency, the Einstenium foundation is looking up to finance research projects in a monthly manner, the projects which will be funded are selected through election process conducted in the community. Malden Trifunovic is the Chairman of Einstenium foundation, and also one of the board members. Malden is a regular crypto investor and a serial entrepreneur. Jonathan Lauziere is the treasurer and also a board member. Erick Calder is the Chief Strategist and also a board member who has thirty plus years experience in architecture and software developing. Rayan Wright is the project coordinator. Vladen Bozilovic is the information technology department leader. Apart from the core, the team consists of people from all around the world. The central objective of this community is to make sure that the platform is entirely decentralized and accessible for anyone. The team consists of people from Taiwan USA Canada and many other countries. The team is completely dedicated to improving the entire infrastructure and foundation of the platforms that they use. 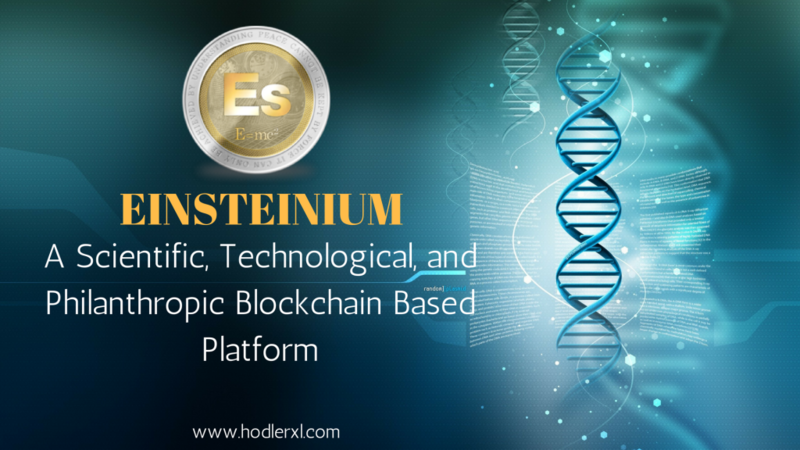 Einstenium has recently integrated their crowdfunding platform to the Einsteinium foundation. Einstenium foundation plays a vital role in reshaping and revolutionizing the scientific research community. Einstenium is based on an open source technology. EMC2 is already a vital organ in the Bitcoin community. THE EMC2 donates two percent to the research fund, and the fund goes to donation purposes. EMC2 is divided into epochs. Each epoch consists of thirty-six thousand blocks of coins. EEinstenium has about 730 periods. Einsteinium has a lot going on now, they have released an array of products and improvements that they will introduce in the near future. They plan to introduce a web wallet for the users to contain their coins securely. The EMC2 mobile wallet is a lightweight mobile wallet that they plan to launch. The EMC2 me is the platform that they plan to introduce for the fundraising process. ‘ Weeee…’ will be the social networking platform of Einstenium. It is messenger which can send gifts including coins to surprise friends and family. You can buy EMC2 directly using credit cards in the superwallet. Finally, in the future, they plan to give Einsteinium awards for the distinguished in the science field. As we said Einstenium foundation works to make funding for science projects. There is no other cryptocurrency in the world which is working as Einstenium does. Einstenium not only funds projects but also works for the betterment of the society. The users are not just going to gain finances but also contribute to the philanthropic vision of Einsteinium. As the company is booming, one who wishes to make money can invest in it, also funding innovative research teams with your small contribution.